Once again Israel is enjoying its seasonal abundance of plants as the land begins to be covered in green with the start of the winter rainy season. Among the flowers all around us, some are better known, others less so. Some are common, others quite rare. 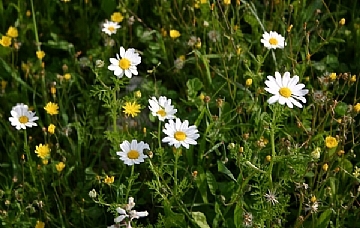 This essay will focus on the Anthemis palaestina, the Israel chamomile, a member of the familiar daisy family. 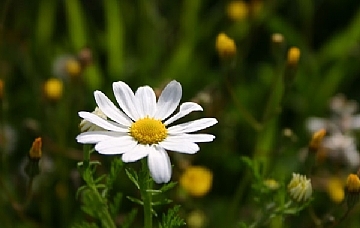 The Israel chamomile daisy is very similar to the common chamomile (Anthemis pseudocotula). 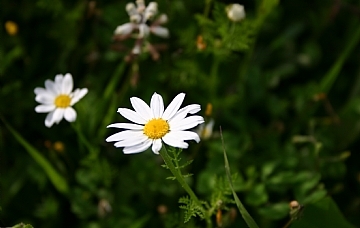 Chamomiles are small plants that bloom in large groups, giving the appearance of a large white carpet with yellow dots. The Israel chamomile is such a common flower that people often fail to look at it closely. But familiarity should not breed contempt: this flower has a rich story and an important lesson to impart. The plant’s Hebrew name, kachvan, is reminiscent of the Hebrew word for “star”, but that is somewhat misleading. In the period before the establishment of the State of Israel, the Academy of the Hebrew Language was the body responsible for helping re-establish Hebrew as a modern, spoken language. When naming plants, one method used by the academy was to “Hebraize” the common Arabic names. The chamomile was known in Arabic as kachwan, which the academy transformed to kachvan in Hebrew. Ephraim and Hannah Hareuveni, and later their children Nogah, the founder of Neot Kedumim, and his sister Ayelet Hashachar, opposed this method of naming plants and sought purely Hebrew names that highlighted their special characteristics, concomitantly searching for references to these plants in biblical and Talmudic sources. In this particular case, the Hareuvenis identified the kachvan as the flower that Jesus speaks of in his powerful parable on faith. Among the many lessons and messages recorded in the New Testament Jesus time and again speaks of trust in God. Is man meant to spend his life worrying about his livelihood or should he trust in the Lord? Jesus continues and asks his followers why they worry about being clothed. “Consider the lilies, how they grow: they neither toil nor spin, yet I tell you, even Solomon in all his glory was not clothed like one of these. But if God so clothes the grass of the field… how much more will he clothe you” (Luke 12:27-29, and Matthew 6:28-30, New Revised Standard Version).